The Grauer School's founding motto is Learn by Discovery®. Grauer is proud to be the home of the Loewy-Linz Innovation Center where our students put this motto into action every day. It is also the heart of our STEM education programs that help students cultivate the efficacy and ingenuity required for success as life-long academics, (future) professionals, entrepreneurs, cultural leaders, and social leaders. STEM Education Programs combine Science, Technology, Engineering and Mathematics into a cohesive curriculum based on real-world factors, needs, and applications. Our STEM education programs prepare students for the challenges and opportunities they will face as responsible participants in our 21st century global community, economy and infrastructure. In addition to a full range of college preparatory STEM education programs, Grauer produces and hosts STEM events every year. The Grauer robotics teams are five-time robotics world-championship contestants, and they have earned an outstanding reputation in the process. STEM education programs are now widespread and well-documented. Unfortunately, many schools omit a fundamentally integral component of living and learning: The Arts. At The Grauer School, we incorporate STEM and the arts into our STEAM education program. A STEAM education program cohesively combines STEM and the arts to help guide student inquiry and dialogue, which helps our student body cultivate critical thinking and problem-solving skills as both learners and social leaders. Our STEAM education program removes the disciplinary limitations associated with classical STEM programs. Electives and clubs in coding, guitar building, design engineering, game design, and graphic arts open up worlds of creativity while promoting technical virtuosity. After all, our global community requires much more than an understanding of science, technology, engineering and mathematics. It also requires wonder, creativity, ingenuity and innovative application. On surveys comparing schools nationwide, our students consistently rate Grauer far above all known norms in providing opportunities for the development of creativity. 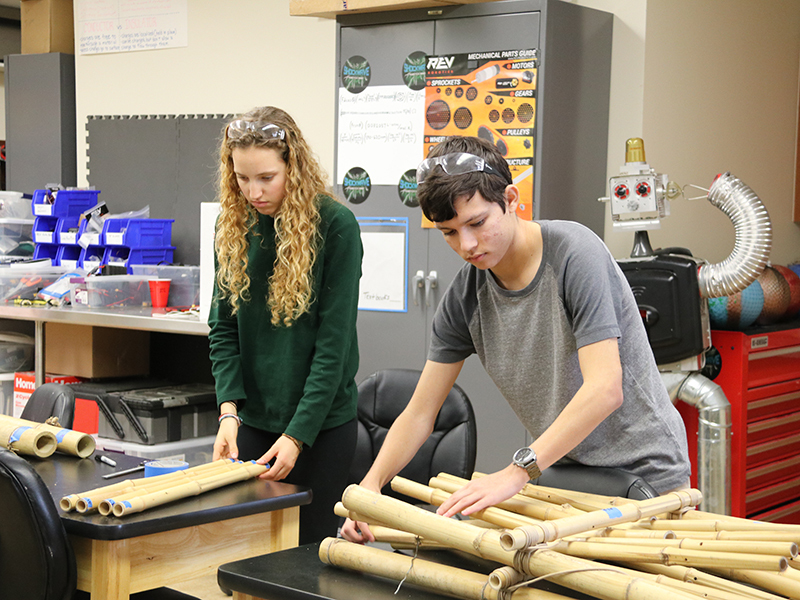 Combining STEM and the arts allows our students to connect STEM principles and ideas with design elements, artistic practices, and moral/ethical standards that places the entire cognitive learning pallette at their disposal. We are proud to provide innovative STEM programs for our high school students. One of our flagship STEM programs is The Grauer School's Robotics Team, Shockwave Robotics #3848, which competes in the FIRST Tech Challenge (FTC) competition each year. All Grauer High School students are welcome to join the Robotics team. Shockwave continues to be a key team in the San Diego region each school year. Our team promotes STEM in the community through outreach events to local elementary and middle schools, and serves the local robotics community by hosting a league meet and a league championship on The Grauer School’s campus. Shockwave is always a fierce competitor in their local league meets and championship events, making it to the finals on a regular basis, and earning a place at the San Diego Regional Championship tournament each year. Shockwave has attended the FTC World Championship competition 5 times in their impressive 10-year history. The continued success of our Robotics team, and all of our STEM Programs for high school students, is due to the innovative dedication of our student body combined with their mentors and the gracious support of their sponsors - The Loewy Foundation, AFCEA, and The Grauer School. Our STEM programs for middle school students stimulate innovation, creativity and ingenuity. Grauer's Middle School Robotics team, the Grauer GorilLegos #3195, competes in the First LEGO League (FLL) challenge each year. All Grauer Middle School students are welcome to join the Robotics team. The First LEGO League challenge involves 2 different components that the students can choose to work on - the Robot Game and the Project. 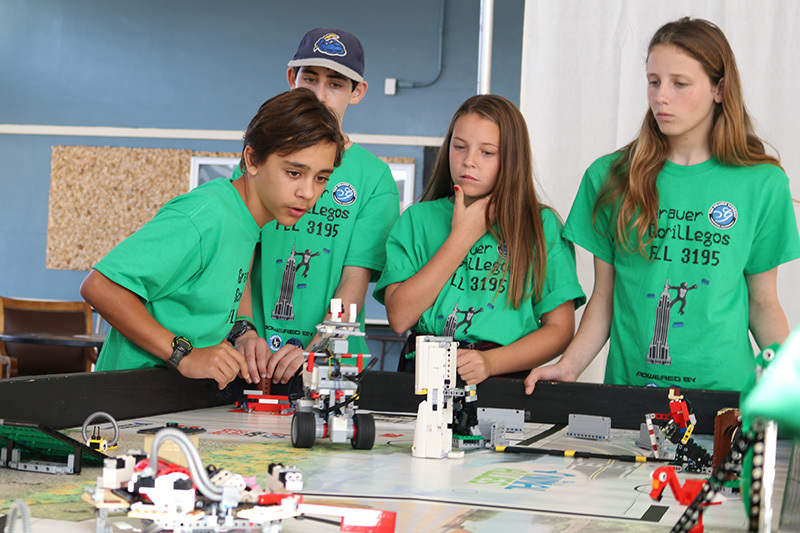 In the Robot Game, teams design, build, program, and test autonomous robots using LEGO Mindstorms technology. 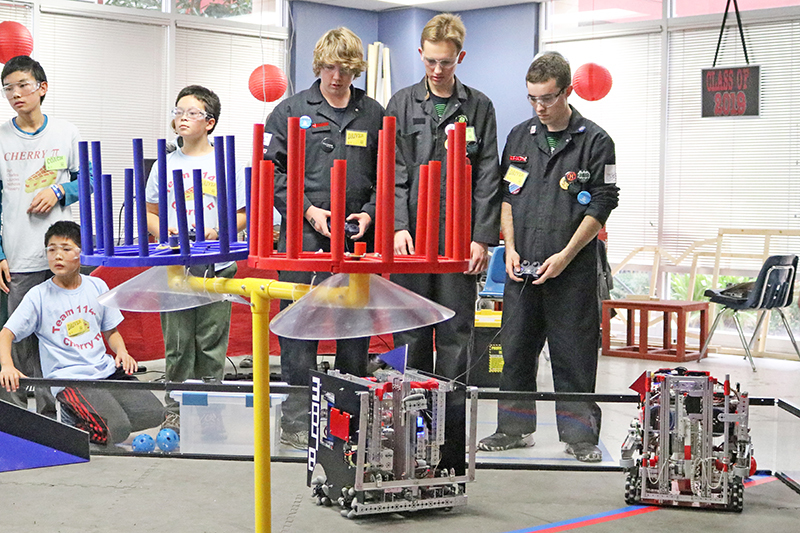 The robots are designed and programmed by team members to perform a series of missions during 2½ minute matches. The Robot Game playing field reflects the real-world theme for each season. In the Project, teams research a real-world problem in the field of each season’s Challenge theme. Then, they create an innovative solution to that problem and share their findings with others. As an integral component of our STEM programs for middle school students, Grauer's Middle School Robotics program provides a fun and educational way to learn about robotics, basic computer programming, robot building techniques, and just as importantly, teamwork! Grauer's Middle School students also participate annually in an Hour of Code programming activity, which gives them the opportunity to learn how to create technology. Through this program, they learn computer science concepts which help nurture creativity and problem-solving skills to prepare them for their future in high school and beyond. To better prepare learners for a world that is rapidly advancing technologically, we provide a bevy of programs to help cultivate technologically-proficient STEM computer science students. As future participants in our global community, students are expected to possess a wide range of skills beyond just simply knowing how to perform basic functions on a computer. Intellectual curiosity is one of Grauer's core values, and it has the added benefit of helping to evolve our computer science course over time, as our STEM computer science students continually bring new ideas, interests and skills into the classroom environment! The Grauer School is proud to provide our students with STEM engineering design programs in a supportive educational environment where freedom of design choices and project planning result in the construction of some really cool projects! Our STEM engineering design programs begin by helping students find solutions to classroom problems that teachers and learners face during the course of day-to-day work. Design challenges are created around these issues and students use tools, machinery and materials in our studio to build their products. In the second semester, our programs expand to include more complicated builds requiring advanced mathematical calculations and multiple prototypes. 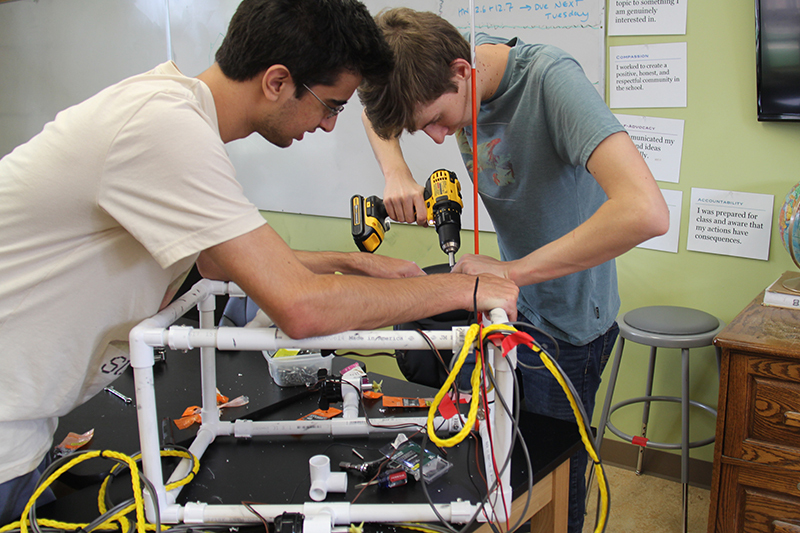 Some of the final projects completed by students in our STEM Engineering Design programs have included a fully functioning ROV with HD camera feed and 3-axis steering, and human-powered pushcarts! Our guitar and ukelele building class also offers students a classic “STEAM” opportunity to build and play. At The Grauer School in Encinitas, the benefits of a STEM program education cannot be overstated. Every innovative discovery, every practical problem solved, and every excited, enthusiastic learner we encounter every day is testament to the effectiveness of the benefits of a STEM program education. As the world leader of the small schools movement, our STEM education programs are enhanced by tight-knit classroom environments and individual attention to each student’s gifts, talents and skills. If you and your middle or high school-aged child would like to experience the benefits of a STEM program education as both Grauer students and global community leaders, we would love to hear from you!